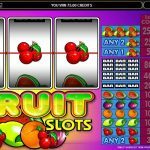 Fruit Slots is a classic video slot game from Microgaming, it seems that we cannot get enough of slots that use fruit symbols, for that reason they still exist in the online gaming world. If you are a fan of this genre then you will truly enjoy playing this game which will take you on a trip down the memory lane. The background of the game is what resembles a rainbow and the symbols are with very vibrant colors too. The main attention in this game is focused on the straightforward game play rather than on graphics and special features. When it comes to special symbols and special features we cannot say that Fruit Slots has abundance of it. This is a classic slot and the main attention is the game play itself. There are no special symbols in this game, not even a wild. We have to say that this is one of the perks of these simple games. 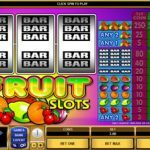 Usually people who like to play online games but miss the old Las Vegas style slot machines then they turn to Fruit Slots. Everything you need to know is in front of you. If you want to check the pay table you do not have to switch to another screen since you can see all the combinations next to the reels. This does not mean that the game does not offer an adrenaline rush, you can play with maximum coins in order to win the jackpot, and sometimes that is the entire thrill we need. Fruit Slots is one of the most popular Microgaming`s slot. 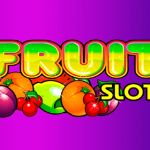 Thanks to the combinations that this game offer, you can land some good cash prizes and many would say that Fruit Slots is exactly what they are looking for in a slot. If you want to try your luck cracking the cookie try playing Fortune Cookie a 3 reel slot by MicroGaming.